A garnet /ˈɡɑːrnət/ is one kind of silicate mineral. There are many different kinds of garnets, containing different metals. Crystals of garnet are often large and pretty. Their most common color is red or purple, but they can be found in almost all colors and are often used in jewelry. In the United States, garnet is the birthstone for people born in the month of January. 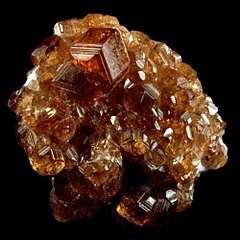 Wikimedia Commons has media related to Garnet. This page was last changed on 16 January 2019, at 23:38.